Notes: As part of the Dover Terminus Act, the South Eastern Railway was allowed to purchase land belonging to Dover Harbour Commission for the station; it was the site of the former Townsend battery. At the same time they were obliged to pay compensation to the thriving community of shipbuilders on what is now Shakespeare Beach also to the owners of the Mulberry Tree – a popular pub – and a rope factory belonging to J Jones. A considerable number of cottages were demolished, 16 belonging to John Finnis along with his factory for which compensation was paid. However, for those cottagers who were too poor to seek legal help, compensation was not forthcoming. Townsend battery, built in 1779, was demolished along with the Cinque Ports Pilot’s lookout station on Cheeseman’s Head. In 1848 this was replaced with a highly ornate tower, built of stone and standing on a bed of concrete 10ft thick. The new tower stood just to the south of the Dover station building; it was eventually demolished in 1913 when a second track was required. Archcliffe Fort stands on a headland overlooking the harbour, known as Archcliffe Point. In order to reach the Dover terminus two 50ft tunnels were driven under the south west corner of the fort. It had been envisaged that the station at Dover would be a grandiose structure. The building designed for the South Eastern Railway by Lewis Cubitt was in an Italian style; it was almost contemporary with London Bridge station, which the South Eastern owned jointly with the London & Croydon and London & Brighton railways. The Illustrated London News was fulsome in its praise of the new terminus at Dover, describing it as ‘imposing and appropriate … a beautiful adaptation of the Italian style. The turret is remarkably effective’. The Florentine turret crowned a lofty campanile which stood at the north-eastern end, at the head of the arcaded trainshed. Stone was used for the lower section of the campanile and quoins, the remainder being of yellow brick. The base of the chunky tower had single arched openings on three sides, set in rusticated stonework. The longer section above had a tall window surmounted by a pediment on three sides opening onto a ‘Romeo and Juliet’-style balcony with an ornate iron rail; then higher up, again on three sides, tall triple windows were fronted by a further balcony. Stone quoins gave this section an impression of solidity, and it was topped with a prominent dentillated cornice beneath a tiled roof. The slim, plainer section above carried clock faces, and the turret above this enclosed a bell, visible through the arches on each side. A further dentillated cornice beneath a shallow pyramidal tiled roof supported a weather vane. This description is taken from the architect’s drawings of the tower which, together with the report published in the Illustrated London News, must have given readers the impression that Dover was provided with a very fine terminus. Sadly this is not true as a lack of money meant that the campanile described above was never actually built. The original architect’s drawings had been freely available prior to opening and were used in the publicity material long after the station opened! In order to counter criticism the company said that the station was only temporary, but when it became evident that the structure was permanent, they had a change of tack. The publicity releases then stated that the station was ‘striking by its simplicity particularly in the dark when it was internally lit by gas lights’! As built, Dover station’s trainshed was within a self-assured Classical building whose exterior presented three storeys on the north-western façade along Beach Street, the lower two boasting an arcade, each arch with a tall rectangular window above it on the upper storey. The architect’s drawing of the building shows that a parapet stood above a dentillated cornice, but later photographs show a plain hipped roof without a parapet. The aracading continued south-westwards along Beach Street behind the booking hall, waiting rooms and other facilities that lined the platform beneath the trainshed. Biddle (1973) remarks that the structure demonstrated that whatever horrors might lie in its hinterland the South Eastern Railway could provide a fitting gateway to England. The trainshed spanned six lines with the passenger platform on the north side. At the west end there was a bay line running along the back of the platform for half the length of the trainshed. The other lines were used for goods or stabling coaching stock. There were three turnplates (wagon turntables) in the centre of the trainshed to allow wagons to be moved easily between lines. There were another three turnplates at the west end of the shed. At the east end of the trainshed on the south side there was a single-storey extension protruding beyond the trainshed housing a loading dock; one side of these also formed part of the trainshed roof. At the east end of the dock beneath the trainshed there were a further two turnplates. Three additional turnplates were to the west of the station outside the trainshed. There was also a timber loading dock at the east end of the trainshed. The station was said to have cost £29,475 out of which Dover Harbour Commission received £23,500 for the land. The line was completed by 27 January 1844 and the trial run was hauled by the 2-2-2 locomotive No.36 Shakespeare. A Board of Trade inspection report of 1 February 1844 showed that a temporary station would be used at first but at the time of the inspection, less than a week before opening; the temporary station had not been built and presumably never was. At 2 pm on Tuesday 6 February townsfolk and visitors, which included dignitaries from Calais, Ostend, Boulogne, Folkestone, Deal, Ashford and London assembled at New Bridge. The Calais contingent had arrived the previous day on the Beaver and included 33 members of the National Guard of Calais band, resplendent in their military uniform and who joined the town and the military bandsmen to lead the procession. The cavalcade, 6,000 strong, set off at 3 pm, the vanguard reaching the makeshift Dover station half an hour later. At 4 pm, a shrill whistle was heard as the Shakespeare engine pulling four carriages, with SER chairman, John Baxendale, and directors, came into the station. The multitude cheered and a gun salute was fired from Archcliffe Fort. This was followed by a sumptuous banquet held in the Assembly Rooms, near New Bridge on Snargate Street. Used as a theatre, it was completely stripped of scenery and machinery to make room for the 300 men who celebrated that evening. The gallery was given over to ladies but, because they were ‘crammed in’ and as they were wearing hooped skirts, they found it difficult to partake of the meal! 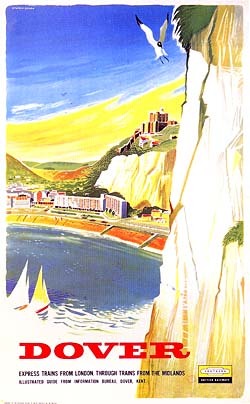 In the speeches that followed it was generally agreed that Dover was the ‘highway of nations’. The final cost of the railway line was estimated to be £3,564,172, two-and-a-half times more than originally planned. The next day the railway opened to public traffic and, according to the Railway Times of 24 February, six trains a day were provided in each direction. Between 8 am until 5.30 pm from London and 7 am until 6.50 pm from Dover. The latter gave rise to a number of complaints from passengers who came over from the Continent on the afternoon ferries to Dover. The Company’s response was that they should use the Boulogne-Folkestone ferry services as these did tie in with the train times – an attitude that never altered! Another source of complaint came from third class passengers, for their carriages were open and, in consequence, sparks from the engine burned their clothes. It was suggested that to avoid this problem they should travel first class! The South Eastern Railway opened a single-road, dead-end shed to the west of Archcliffe Tunnel on 7 February 1844. The shed was brick-built with a pitched slate roof; there was an adjacent turntable. A second single-road, dead-end shed was opened on the south side of the line, opposite the first shed, on 14 February 1844. By 1850 the railway was beginning to eclipse coach travel as the preferred form of transport. Charles Dickens first travelled on a train to Dover when he was going to Paris in 1851, having previously undertaken the journey by mail coach. He was astounded both by the comfort and the speed but asked what the SER had done with ‘all the horrible little villages we used to pass through'. Part of the plans for the station had included a terminus hotel and this was eventually built on the land originally designated for the station. Designed by Samuel Beazley, it was named after the Lord Warden and the Duke of Wellington, who had actively promoted the railway. The hotel opened on 7 September 1853 and although both men were deceased, everyone raised their glasses to the Duke and Samuel Beazley. The hotel was aimed at the wealthier cross-Channel travellers, and a few years later a covered walkway to the station was provided from the first floor. Charles Dickens was a frequent guest. The first part of the Admiralty Pier was finished by 1854 and fully completed in 1871. 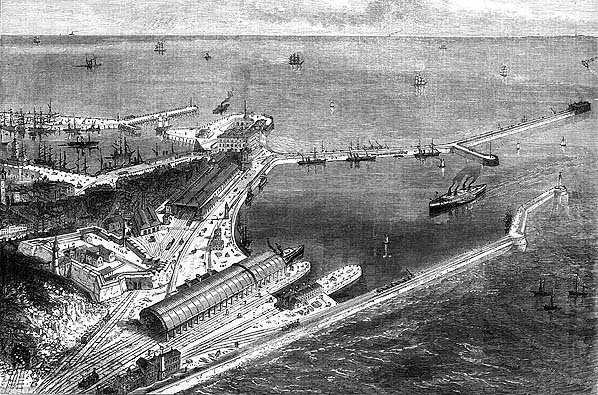 On 1 September 1854 the Admiralty agreed that passenger trains would be allowed on to the Pier, and in 1860 the southernmost line at Dover Town was extended through the back of the trainshed curving round on to Admiralty Pier. By late 1861 the SER was running trains along it on a single track from the terminus. As the 1848 pilot's tower stood in the way of the new line the ground floor, which had a ceiling height of 20ft, was gutted to allow trains to run through it onto the Admiralty pier. Some time before 1862 the engine shed on the south side had been closed and demolished following the opening of a brick 4-road straight dead-ended shed with a twin hipped slate roof at the west end of Dover Town station on the north side of the line. The site was so cramped that the depot's turntable had to be sited behind the remaining 1-road shed to the east of Archcliffe Tunnel. On 22 July 1861 the London, Chatham & Dover Railway opened its line from London through to Dover. On 1 November 1861 this was extended to a new station called Dover Harbour on Elizabeth Street, close to the SER's terminus which was renamed Dover Town; this name first appeared in company timetables in December 1861. At the same time the LCDR's station was renamed Dover Priory although in its early days it was sometimes confusingly called Dover Town Priory. Although adjacent to the harbour, LCDR passengers had to walk along Admiralty Pier to reach the ferries. The SER had always intended to concentrate its ferry services on Folkestone but eventually buried its pride and moved the Princess Clementine, an iron paddle steamer built by Laird Brothers and launched in 1846, together with the Princess Maud, built by Ditchburn and Mare and launched in 1844, from Folkestone to Dover. The ships plied between Dover and Ostend but the service was short-lived, ceasing in April 1862.Thereafter the SER concentrated most of its resources into developing Folkestone Harbour, which became its principal base for cross-channel ferries. 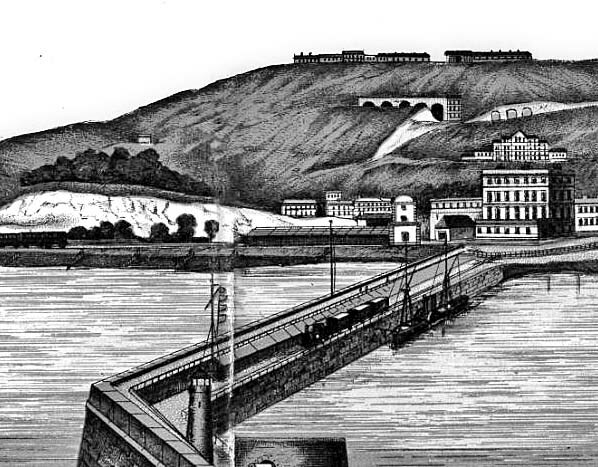 Dover Harbour was not a terminus for long as the LC&DR extended its line with services first running to the Admiralty Pier on 30 August 1864 where separate platforms were provide for both the LCDR and the SER. One of the problems that SER constantly faced was that from Folkestone to Dover the tracks extremely close to the cliffs and sea. On 14 November 1875 there was a severe storm that wrecked the defensive groynes, severely damaged the Town station roof and flooded the track. Two years later, following a landslip between Folkestone and Dover, the Town station closed on 12 January, reopening on 12 March. In June 1881 a double-track spur known as the Hawkesbury Street Curve was opened to the London Chatham & Dover Railway’s Harbour Station creating a triangular junction. This branched off the main line just before it entered the Town station. In 1878 a 60-lever signal box had been opened close to the east portals in preparation for the curve; it became Archcliffe Junction box. This new line allowed through working of South Eastern Railway trains onto the newly opened joint line to Deal. As this meant that some local services bypassed the Town station, platforms were opened on the through line on 1 October 1885 despite the proximity if the LCDR station at Dover Harbour. These platforms were, however, short-lived and were closed in 1903. By the end of the nineteenth century the SER and LCDR had fought over a small - and not particularly lucrative - territory for 40 years. Both were notorious for the poor quality of their services and decrepitude of their stock, and the struggles had driven both companies to the verge of bankruptcy. It became inevitable that they must combine or succumb. The South Eastern & Chatham Railway (SECR) was formed on 1 January 1899, when the SER and LC&DR formed a ‘management committee’ comprising the directors of both companies. This merged the two companies' operations, although they remained legally separate, with receipts split 59% to SER and 41% LC&DR until the Grouping, to avoid the costs and risks of a formal merger. The miners’ strike which began in March 1912 and continued to the end of April created a national fuel shortage. Railway services were hit and the Town station closed. The cross-Channel ships were concentrated at Dover but coaled up in Calais. Two years later when the South Eastern Railway decided to concentrate local passenger services at the Priory station the Town station was closed on 14 October 1914, ten weeks after World War I was declared on Tuesday 4 August. At this time, all locomotives in the area were moved to the LCDR’s 4-road shed at Dover Priory which had opened with the station, and the two sheds at Dover Town were closed. After the shed was demolished, eight sidings were laid down partly on the site of the shed named after the nearby Bulwark Street. The recently completed, but as yet unopened, Marine Station was commandeered for military use and the Town station was used as an ambulance station for dealing with the seriously injured returning from the frontline; during the war it was sometimes referred to as ‘military platform’. There was occasional military use of the platform until after WW2. On 19 December 1915 a landslide completely blocked a mile of track between the Martello and Abbots Cliff tunnels and the line remained closed for the duration of WW1. The reopening of the route between Dover and Folkestone took place on 11 August 1919, the line having been reconstructed during the spring and early summer. The final closure of Town station was also confirmed from that date. Except for the part used as mortuary the Town station remained unused. 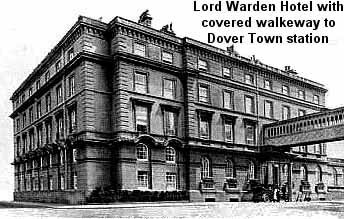 It was decided to convert the portion nearest the ‘Lord Warden Hotel’ into offices for the Marine Department. Photographs taken in 1921 show that the station was largely intact but the trainshed had gone. It is not known when it was demolished; perhaps it was after the roof was badly damaged following a storm in November 1875. It is also noted that the wooden loading dock has also been extended and now forms an island with the southern face alongside the line to Admiralty Pier. SECR became part of Southern Railway under the Grouping that came into operation on 1 January 1923. The Marine Department offices at the old Town station were converted into offices for the operating staff of the Eastern Division who were responsible for 744 miles of railway. Another part of the old station was demolished. A new viaduct over the Hawkesbury Street curve was opened in 1923 and was built to provide easier access to the Western Docks since it bypassed the level crossing on Elizabeth Street. It was replaced with the present viaduct in about 1980. In the early 1920s the railway’s demand for more tracks resulted in parliamentary permission being given for the removal of the southern half of Archcliffe Fort and the twin 50ft tunnels were opened out in 1928. In 1928 the Southern Railway opened a concrete 5-road shed, with an Eastlight roof and one through road, as well as a large marshalling yard at the rear to the west of the Town station. It included a 65ft turntable, a coaling plant, and a water tower with a water softener plant. The yard covered much of the station site and included a marshalling yard and access from the Folkestone line to Dover Western Docks. The platform was partially rebuilt with a curve towards Dover Marine and Archcliffe Junction signal box was resited to the west end of the platform; this opened in June 1928. A record in the National Archives (AN 157/469) describes a staff halt at Archcliffe Junction signal box in January 1948. This was presumably the old Town platform. In September 1930, the rear of the Town Station was turned into a lock-up garage complete with petrol pumps. This was the second garage to open in Dover. The shed closed on 12 June 1961, although steam continued to visit until October 1961; it was demolished in 1979. The remaining Town station buildings were demolished in December 1963 and Beach Street was demolished in 1976 to provide a parking area for ferry traffic. The Dover Town freight yard remained in use for the marshalling of ferry wagons arriving and departing through Dover Western Docks. The yard was used for some time as a loading area for the Motorail service with cars being loaded from the platform. The yard became redundant with the opening of the Channel Tunnel with the first freight running through the tunnel on 1 June 1994. The last train ferry sailing was the 13.30 from Dover on 22 December 1995 by which time all general mixed freight was going through the tunnel. No further traffic was handled by the yard although it was used for the storage of condemned wagons for a few months. The track was lifted in 1997 although Archcliffe Junction signal box did not close until 12 April 1998. Note: Great care should be taken when researching Dover Town on the web as a number of web sites confuse Dover Town with Dover Harbour. Tickets from Michael Stewart. Bradshaw from Alan Young. Route map drawn by Alan Young. 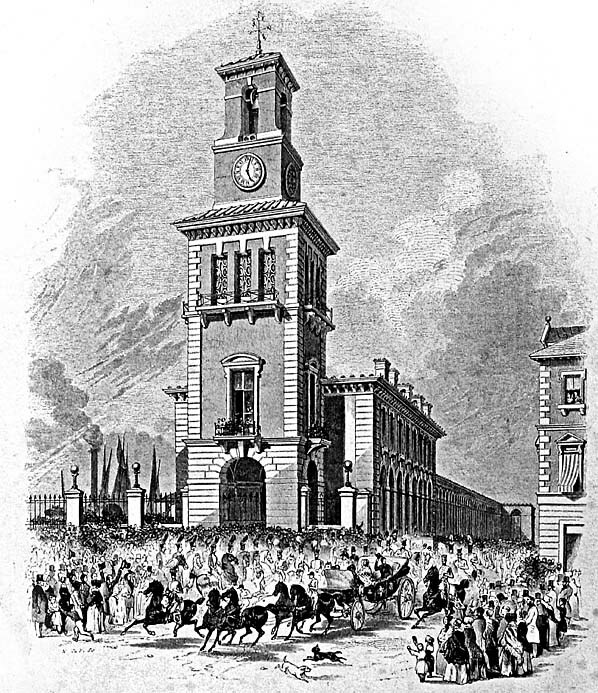 Lewis Cubitt’s drawing of the planned Dover station, complete with its imposing campanile, was sent out with the publicity material to promote the opening of the station in 1844 despite that fact that the campanile has not been built owing to lack of funds. Some of the other decorative features were also omitted from the building which the South Eastern Railway later described as ‘striking by its simplicity'. the line, virtually overhanging the beach. This was closed and demolished when the four-road shed was opened. 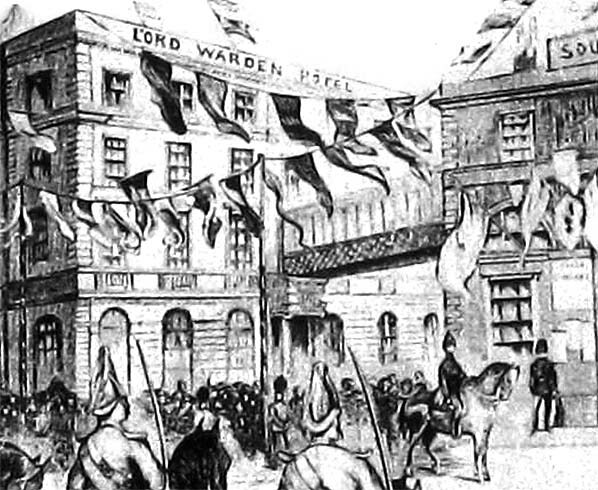 The ‘Lord Warden’ Hotel to the east of the station opened on 7 September 1853, but as yet the covered bridge linking the first floor of the hotel with the station has not been built. 1898 1:2,500 OS map. 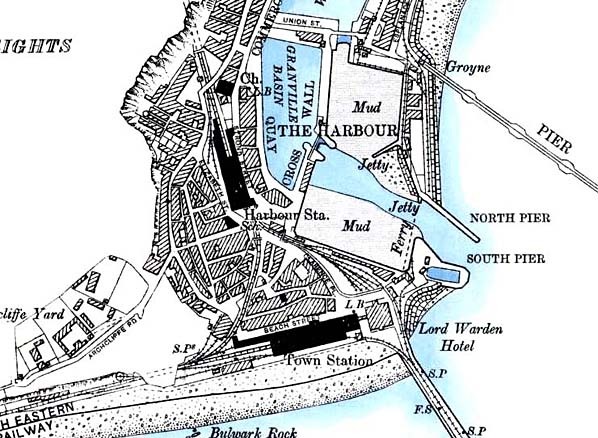 Little has changed since the 1865 map - the Hawkesbury Street Curve has been built linking the Folkestone line to the LCDR at Dover Harbour. Two platforms for the Town station were opened on the through line on 1 October 1885 but they are not shown here. With the opening of the spur the LCDR station was renamed Dover Priory and the SER is identified here as 'Town Station'. A weighbridge and a crane are now identified alongside the goods shed. The original Archcliffe Junction signal box is seen close to the east portals of Archcliffe Tunnel. The LCDR has built 8 sidings between its line to Admiralty Pier and Clarence Place. Click here for a larger version. Southern Railway plan showing the layout of lines on the approach to Dover Western Docks. 1958 1:2,500 OS map. Much has changed since the closure of Dover Town station in 1914. The station building fronting onto Beach Street has been demolished with only the end block remaining and identified here as a warehouse. The trainshed was demolished before closure of the station. In 1928 the Southern Railway built a five-road shed, with one through road; it included a 65ft turntable, a coaling plant, and a water tower with a water softener plant. The yard covered much of the station site and included a marshalling yard and access from the Folkestone line to Dover Western Docks. The platform has been rebuilt with a curve and an end loading dock and is used for loading cars onto transporters. Archcliffe Junction signal box is seen at the west end of the platform. The earlier four-road signal box to the west of the Hawkesbury Street curve has also been demolished with the Bulwark Street sidings being built partially on the site of the shed. A crane is identified to the west of the sidings. Archcliffe Tunnel, to the west of the station, has also gone. This was opened out in 1927 and much of the fort was demolished. In 1923 a new viaduct was built to replace the level crossing over the Hawkesbury Street curve in Elizabeth Street. Click here for a larger version. This engraving from the Illustrated London News of 12 March 1870 shows a proposed, but never built, Channel ferry station and pier to the west of the Admiralty Pier. It also shows Dover Station with a twin hipped trainshed (overall roof) The pilot's tower is seen to the right of the trainshed but the line onto the Admiralty Pier appears to avoid the tower when, in reality, it passed through the middle of it. It is assumed that is correct rather than artistic licence. Also shown is Archcliffe Fort with the railway passing under the southern end of the fort through Archcliffe tunnel. In the bottom left corner there is another tunnel taking an unknown line under the north side of the fort at a lower level; this is clearly artistic licence. Perhaps this is an incorrect interpretation of the Hawkesbury Street curve which would not be built for another 11 years. The c1860 engine shed is shown in the correct position between the fort and Dover station. Click here to see a larger version. This engraving c1880s also shows the trainshed at Dover station. The roof was removed at an early date, perhaps before the end of the 19th century. The trainshed is unusually low much taller station building is seen to the left if the Lord Warden Hotel. A train is seen on the Admiralty Pier in the foreground. The line from the pier curves round un front of Dover station passing through the ground floor of the pilot's tower. 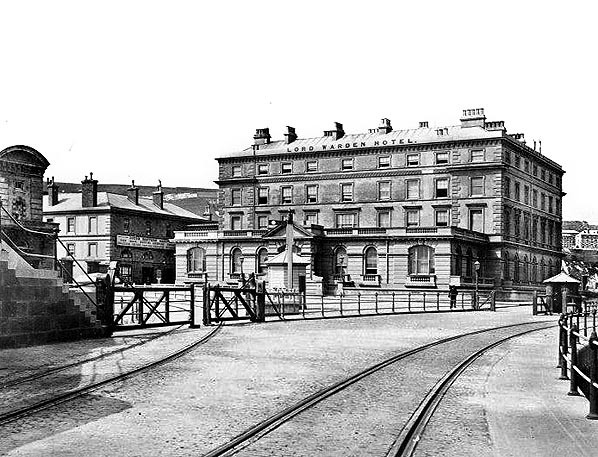 The ‘Lord Warden’ Hotel c1870; the Town station is seen to the left of the hotel and the high level bridge linking the two buildings can just be made out. In the foreground the two lines to the Admiralty Pier are seen, the SER line to the left and the LCDR line to the right. The building on the far left is the Dover pilot's tower. This was built in 1848 to replace to replace the pilot's station on Cheeseman's Head which was demolished to make way for the South Eastern Railway track. When the line to Admiralty Pier was built the tower was in the way, so rather than demolish it, the ground floor was gutted to allow trains to run through it! At noon on Saturday 14 July 1883, a Royal Salute announced that the third son of Queen Victoria, HRH Prince Arthur Duke of Connaught and his wife, Louise, had arrived by train at the Town station. The covered bridge linking the first floor of the ‘Lord Warden’ Hotel and the Town station is seen in this view.